Colourful paper baking moulds are the perfect asset to your self made muffins and cupcakes – but did you know that you can use these muffin liners to craft decoration like this Pom Pom garland. 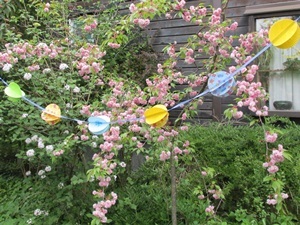 You only need a little bit of crafting gear, and with a few steps your can create this garland – a great piece of decoration for mother's day. Daddies and kids can smooth, fold, glue together and create this holiday decoration. The cupcake liner garland will suit as great decoration for many festivities; children birthday parties, baby shower, weddings, BBQs and muffin party. 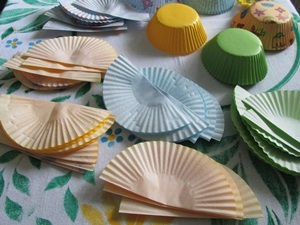 Use colourful muffin cases to give highlights with certain colours and match the muffin liners to your table decoration. What we like especially about this garland: with different designs of paper baking cups you can create a charming mismatched look, which can find its continuation with the design of the plates you use on the table. 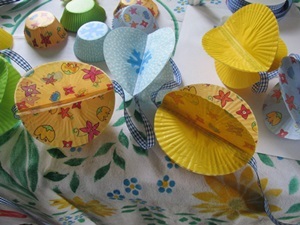 Start with flattening the paper cups and fold into halves, coloured side inside. For each of the Pom Poms you need at least 5 folded muffin cups. As soon as you have folded them, put them under a book to flatten them. And on you go with smoothing and folding. 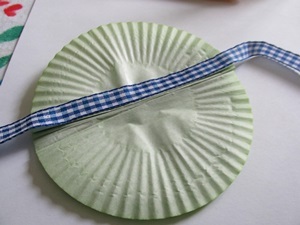 Smooth paper baking cups and fold. Matching our blue-yellow-green table decoration we used muffin cases in yellow, blue and green, some of them uni-coloured, some with polka-dots, some with colourful flowers on blue and yellow ground. Glue them together on their lighter shaded outsides. For the first step we glued together five halves, without closing the Pompom. Again we pressed them to lie flat under a book. This enables the glue to be pressed flat and to dry evenly. You can let these dry Pompons rest for the night. The last steps consists in closing the still open Pom Poms and fix them to a cord. It comes handy that this is all happening in the same work step. Glue halves together and insert ribbon for the garland. Take the Pompom and put the sides together and check the corners – use some glue if the middle of each pompom does not close properly. As cord we used a white and blue gingham ribbon which we glued directly into the Pom Poms. Apply some glue directly onto the ribbon and on the not yet glued muffin case half. Put the ribbon to the edge of the folded muffin case, add some more glue onto the ribbon and the other half of the muffin case and now close the Pom pom. We added a Pompom every 20cm to the ribbon. For a meter of garland you need 4 Pompoms. For a 10 meter garland you need 31 Pompoms and at least 155 muffin cases. And at least, two, three or four muffins to enjoy during crafting, find some proved and tested muffin recipes below. 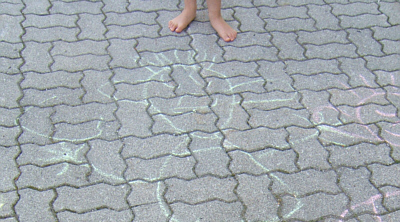 More DIY and crafting instructions for several occasions can be found in the category "For Children". Another crafting idea for Mother's Day and a perfect last minute gift idea are our Mother's Day gift coupons. 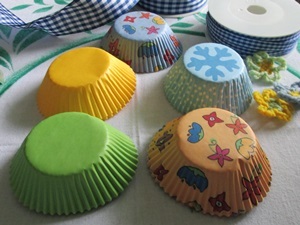 Have fun crafting with muffin liners!